Allen Iverson was back in Philly last weekend, albeit on the sidelines. The Crossover chatted with the 76ers legend and Ice Cube about the BIG3's first few weeks, the NBA at large and more. PHILADELPHIA — In the bowels of the Wells Fargo Center, just a few feet from the mouth of the 76ers’ home locker room, Allen Iverson is back in the house that he built. The arena was erected in 1996 in conjunction with the Georgetown product’s rookie season and has seemingly changed names with each Sixers era since—his early career, Philly’s rise to championship contention in the early 2000s, the middling years that followed, and this current rebuild. 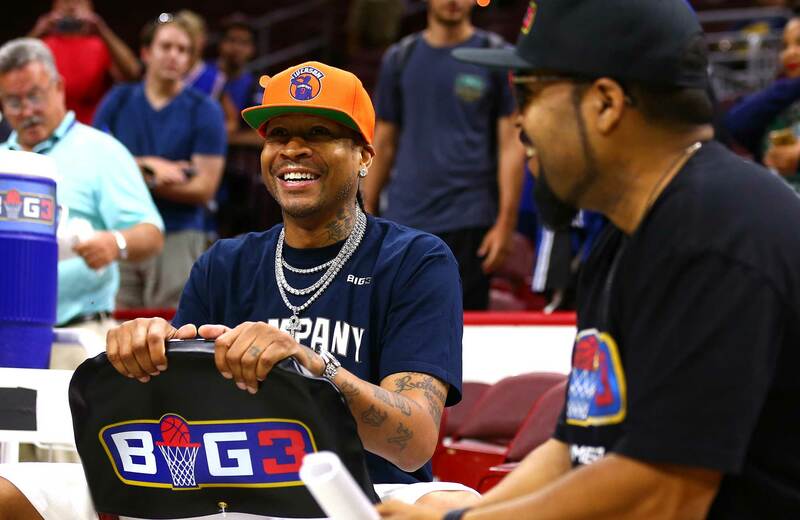 Iverson's returned home as a part of the inaugural BIG3 season, the half-court 3-on-3 league consisting primarily of retired NBA players. 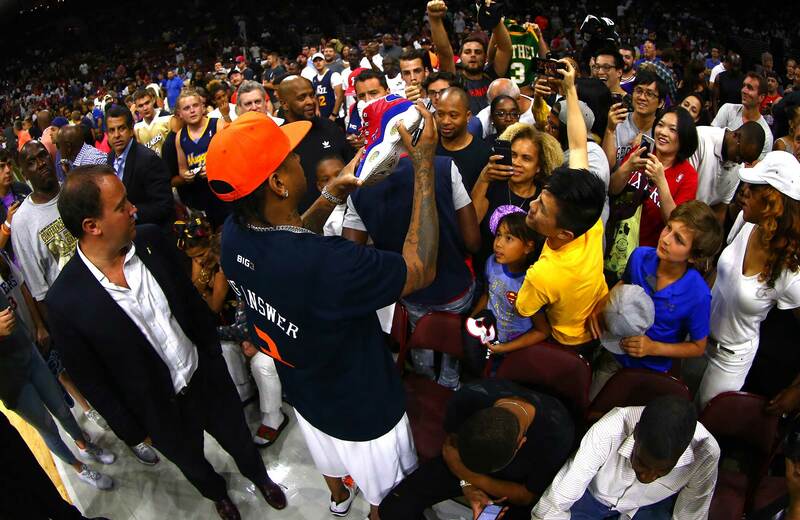 Yet Iverson looks the same as ever; a navy 76ers hat and its white-and-red-striped brim covering his black Louis Vuitton shades, maroon tee, navy shorts and white Reebok kicks. To his right sits Ice Cube, the hip-hop legend and league’s creator, rocking a navy blue crew neck with a cartoon Iverson and “The Answer” printed in yellow bubble letters across the chest. 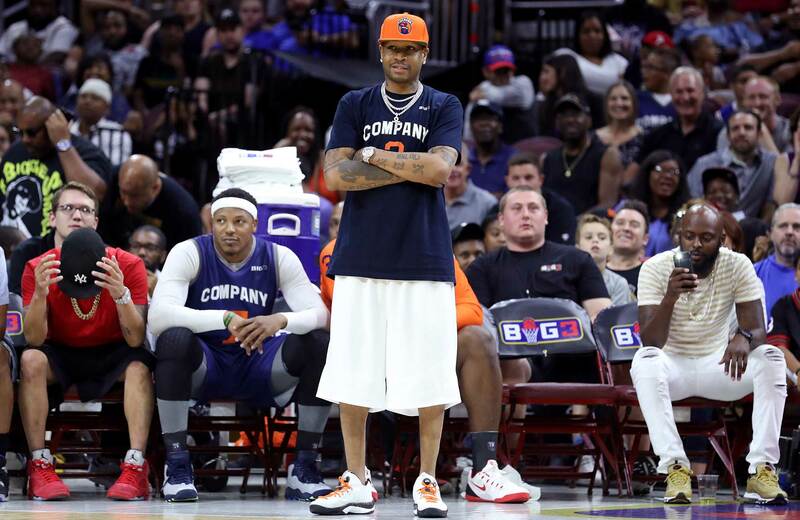 The Crossover caught up with Iverson and Cube the day before the BIG3 took the court in Philly last Sunday. Iverson ultimately sat out the festivities due to doctor’s orders, but both he and the rap mogul spent some time discussing their new league, the Sixers and the NBA at large. Jake Fischer: How does it feel to be back in this arena? Allen Iverson: Flashbacks. That’s about it, you know what I mean? I like coming back during the season, so I can see everybody, everybody that works in here: the security, the training staff. There’s a lot of people still here, especially the security. And you know I got a relationship with Lump [Philadelphia’s Director of Basketball Administration Allen Lumpkin] and [Sixers longtime equipment manager] Scotty Rego and guys like that. They were with me through my whole career. JF: What’s been the best part about being a part of this BIG3? Iverson: The fan reaction and seeing how well it’s doing. All these guys playing in this league did not disappoint. It’s been fun. It’s been fun watching the games, seeing the guys compete and, like I said before, it’s only going to get better. I’m just happy I can be apart of it. JF: Cube, has the BIG3 exceeded your expectations? Ice Cube: I wouldn’t say it exceeded my expectations—because I have high expectations for this league, higher than where we at now—but it’s definitely a great launch, it’s a great reception, great guys. The league is going to be as passionate and as serious as the players take it and they’ve shown us—even A.I.—that they really want to win. Which shows me that guys want to be the champions of the BIG3, and that to me is one of the most important things. Because if we can’t get our players invested, how can we get our fans invested? So, it’s just been remarkable that these guys who, come from all different kind of NBA pedigrees, and also guys who don’t need the money, still playing for each other, playing together, playing as a team and it’s just great, man, just to have guys playing basketball against their peers again. JF: What was the recruiting process of getting guys like Allen and Chauncey Billups and the top guys? Ice Cube: I think it’s all relationship-based. I think I’ve had relationships with players that, from those relationships, they believed in me—and coaches, too, like Gary Payton. But also, you know, people like Roger Mason, Jr., who’s played with these guys and knows these guys and is able to call the right people and get us on the phone with guys and let ‘em hear our passion. Once they were able to hear our passion, I think they were able to understand that what I was trying to set up for them, set the right stage, the stage they deserve, and honor them even as retired players, which to me, you’re never a retired baller. You might be retired from the NBA, but you never retire from being a baller. That’s why I’m grateful that these guys took a chance with me. JF: We’re sitting on top of the Sixers’ logo, what’s your relationship like with the franchise. You and Kevin Hart went to a practice a few years ago. Cube: We were grateful that the Sixers welcomed us that day to do a promotion. We’re grateful that we’re in this building and now we can honor A.I. and Dr. J. like they’ve done so many times now, we get a chance to do it in our small little way and it’s a great thing for Philadelphia. JF: When you came back to Philly in 2010, what was it like to share experiences you had in the playoffs with those young guys like Andre Iguodala and Jrue Holiday and Thad Young? Iverson: It was good for me. But I wasn’t being fair to my teammates, the fans, or the organization for that matter, because I wasn’t there mentally. For two hours on the basketball court, I never think about nothing other than basketball. But my daughter was sick at that time. I remember once, there was a play where someone was shooting a free throw, and you know, I was gone. All I was thinking about was my daughter at that moment. Then I would go out the game, and I would think about her, so eventually I was like, ‘Man, I can’t do this.’ That was my reason for retiring. I wasn’t being fair to the organization because I wasn’t there all the way. JF: When that crew made it to Game 7 of the Eastern Conference semis against vs. Boston, were you in touch with those guys still, or were you just watching them from afar? Iverson: Yea, just from afar. After I retired, it took a while for me to even watch the Sixers play, you know what I mean? It took a minute for me to do it. But I got it together now. I’m a big fan of ‘em. JF: When did you first meet Joel Embiid? Because that was a big moment for this fanbase. Iverson: It was at a game his first year. But I mean, our direction, man, our future is bright, you know what I mean? All that young talent, throw a couple veteran guys in there with them young boys, and teach ‘em the way, we gonna be fine. I see us going to the playoffs this year. JF: Have their been any special moments with Joel or Ben Simmons in teaching them how to be a star in this city? Iverson: I only talked to Ben briefly and all I told him was, 'Man, good game, bad game, as long as you play hard these people will support you. They’ll be right on your side.' I think a lot of times, guys are talented, but if you don’t have no heart with the talent, you’re just going to be an average player. These people around here want to see you get down and dirty and get out on that floor and go after loose balls. As long as you play hard, you’re fine with these fans here. JF: With the league now in an arms race against the Warriors, what’s it like to watch it as a retired player who used to be at that level? Iverson: I just, I don’t know. I was never the type, you know, I feel like if I had four guys on the floor with me that played hard night in night out, I was satisfied with that. I never thought about being on a superteam or anything like that. I don’t think there’s been a time where you basically knew who was going to [win] the Western Conference finals. It’s already permanent magic marker their name: Warriors. It’s just whoever come out of the East. It wasn’t like that in my career.